True caribbean design with amazing views! * Great villa for families or couples getaways. This lovely St. John home with a Hawaiian name certainly lives up to it's moniker. This "Heavenly Home" is a 4 bedroom 3.5 bath with authentic Caribbean flair tucked into a lush green garden on the hillside of Maria Bluff. Hidden away and yet close to everything, Hale Lani is 5 minutes from Cruz Bay and close to world renown beaches of the north shore. 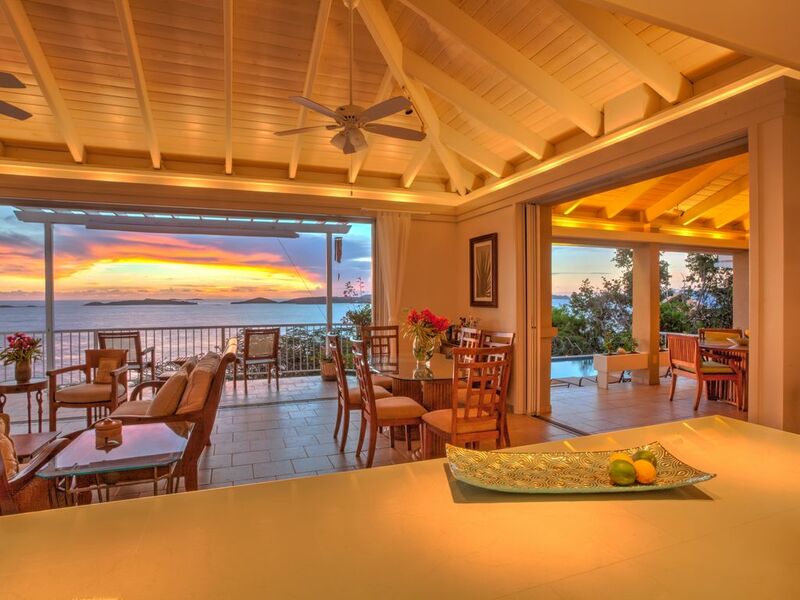 9 ft. tall sliding glass pocket doors seem to vanish bringing the Caribbean sea and amazing sunsets to every room. You enter the house through a flower filled garden into a "lanai" or large covered breezeway which opens up to a very private and inviting pool with endless views of the Caribbean and beyond. Sunbathers and shade seekers alike can enjoy time together in this area with everyone finding the comfort they desire with outdoor seating for 10+. Listen to the ocean waves hitting the shore from the pool deck. Lush tropical gardens surround your hideaway and a colorful palette of flowers beautifully frame the cobalt, sapphire and teal shades of the Caribbean. Open the doors and allow the colors and fragrances to awaken your senses. Hale Lani has 4 large air conditioned bedrooms, 3 kings and 1 with two twins, placed on two levels for optimum views and privacy. The two master bedrooms have large closets and full baths ensuite with native stone outdoor showers. The two lower bedrooms are adjoining, have large closets and share a large full bath. All four bedrooms have large sliding glass doors with romantic sunset views and the lights of St. Thomas at night. A bright and airy kitchen is well equipped and opens into the living/dining area. The floor to ceiling sliding glass pocket doors disappear into the walls allowing three sides of this area to open up and bring the Caribbean breezes indoors. Enjoy everything the beaches of St. John have to offer with our 2 standup paddle boards at no extra charge! Lessons are available and should be scheduled upon arrival to the villa. Beach chairs, snorkel gear and beach towels are properly maintained and cleaned prior to your arrival. Whether you are looking for adventure, relaxation, or a combination of both Hale Lani gives you everything you need. Come and create some memories that are sure to never fade! Contact the owners of Hale Lani today! When shopping for homes on St. John we were looking for a home that had unique architecture. One that had characteristics that lived and breathed "Caribbean" not one that you could pick up and move to anywhere else and have it make sense. Step foot in Hale Lani and you will know exactly what we are talking about. Expansive views, open air living, all the comforts of home, and a design that allows St. John's natural beauty to be the star of the vacation and an experience you will never forget. Hale Lani is that home! The design of this home and it's amazing views stole my heart the first time entered the property. The name Hale Lani means "heavenly view" and it truly is heavenly. The main part of the house has three sides that are 9 ft. tall sliding glass doors. When you open the doors they disappear by sliding into pockets built into the corners of the room leaving you with wonderful breezes and amazing views. Whether you are looking for a romantic sunset with your lover, a lively setting for a cocktail party or an evening around the pool with the family, you are sure to find it here. toilet, shower, Family suite shared bath. Hale Lani has expansive westerly views of the Caribbean ocean, St. Thomas, Greater St. James, Little St. James, St Croix, Vieques, Culebra, and Puerto Rico on the horizon. Two large living room areas. One indoor and one under the lanai. Well appointed open air kitchen. Well designed for efficiency and openness to the living room area. Some board games and playing cards available. Private balconies from the two master suites and large balcony off of the living room area. sun deck big enough for the whole family. Golf course is located on St. Thomas. FREE 24 hour concierge available. Grocery and Liquor provisioning available for a 20% charge of the cost of the provisioned purchased. Massage, private chef, bartender, and housekeeping services and taxi services are available at an extra cost. Please ask owner about these services when booking. Hale Lani was incredible. Well equipped kitchen. Beautiful views and sunsets. Convenient location. Loved everything about it: Paddle boards & snorkel gear, outdoor showers, comfy beds. Julie and David made everything easy. Owners are so nice, very communicative and helpful. There is nothing about this house that we didn't LOVE! We were 2 families of 8- 4 adults and 4 teens. Lots of room for everyone to spread out and we especially loved that the teens had their own area downstairs to sleep. The catered breakfast our first morning was such a nice touch. Sitting on the lanai to watch the sunset was one of our favorite things to do. The views were amazing from everyone room of the house. Bedrooms were large and comfortable and we especially love the outdoor showers in the 2 masters upstairs. David and Julie recommended things to do, places to see, restaurants to eat at, and they were spot on! David and Julie were always available to answer questions and David met us at the car rental to show us the way to the house and walk us through. Thank you for such a great stay at your house, we are already planning our next visit! Everything you want, nothing you don't. Comfortable bedrooms, expansive views, great living areas. The villa is well stocked and cared for. Two adults, three small children, we couldn't have been happier and hope to return. Great place to stay with amazing views. Property was well kept and clean. Ready for us to enjoy. Great views great place great times! From arrival to departure we had a great experience. Fun to drive the Jeep on the island, and had great weather. Accommodations were great, tropical feel, great pool, and the sights looking at Chocolate Hole and Cruz Bay were awesome . Had room for the family with room to spare . Can’t go wrong with this place! All of the beaches, snorkeling, boating, and hiking of The Virgin Islands National Park are a short 10 minute scenic drive away. Hale Lani is located just minutes from St John Market (the finest grocery store on St. John) and The Lemongrass Restaurant within the Westin Resort. A short 5 minute drive to all of the Cruz bay shopping and dining. St. John is the Jewel of the Caribbean. With the majority of the land and much of the surrounding waters designated as a United States National Park, St. John consistently is voted as a top vacation destination by readers of Islands Magazine and Caribbean Travel and Life. St. John was ranked the number one vacation destination in the Caribbean. We Love to share this special Island with friends new and old. Contact us for availability at Hale Lani today. SECURITY/CANCELLATION POLICY This reservation is fully refundable up to 90 days prior to arrival less credit card fees. If you cancel the reservation 30 or more days but less than 90 days from arrival, 50% of the full rate quoted will be charged. Any cancellations 30 days from rival will be charges at the full rate quoted. We strongly urge you to purchase travel insurance.